In Midgar, a city controlled by the mega-conglomerate Shinra Inc., the No. 1 Mako Reactor has been blown up by a rebel group, AVALANCHE. AVALANCHE was secretly formed to wage a rebellion against Shinra Inc.
That will happen. Experience the beginning of a revolutionary story. Note: If this looks familiar, it should be. Consider this an unofficial sequel to my previous forum rp which was heavily inspired by events from Final Fantasy 7. Now I'm going to completely use Final Fantasy 7's events for the rp. You don't have to know about Final Fantasy 7 to participate in this. I highly recommend checking the game out, but in no way do you have to know anything about it to play. 1. No godmodding, powerplaying, metagaming, etc. 3. As far as weapons and magic go, guns coexist with swords, axes, etc. Magic can be used by anyone as long as they have Materia - an object made from <spoiler material> which is applied to a weapon to cast magic. Unlike my previous forum rp, there are some limits on races you can choose. This is so it fits within the FF7 universe. This is the most basic race. They are the most populous race on the planet. They can be found anywhere, usually in towns. If you want an example, you are one. This is a genetically modified version of a human, produced by Shinra Inc.'s nefarious scientific activities. They are used in Shinra's elite SOLDIER class of soldiers. They basically have some sort of power, such as better strength or shapeshifting. Cyborgs also fit within this category. These are machines with sentience designed to do a certain task, whether that is cleaning, guarding, or being a knowledge bank, robots assist other races. These are horrific creatures created by Shinra's science program. They have usually escaped into the wild, terrorizing passerby. They can come in all shapes in sizes. If one were to be found in a civilized area, they would be quickly hunted down. These are descendants of the Ancient people, who came to the Planet from space. They look identical to humans but can communicate with spirits and understand the Planet's emotions (that is something you'll have to figure out). Not much is known about the Cetra's powers. They are a nearly extinct race, with the only known Cetra being Aerith Gainsborough. These are the former residents of Cosmo Canyon, although most have gone extinct except for one named Red XIII (actual name Nanaki). They look like this. They make very good warriors. If you have a race to suggest, feel free to do so. I'll review it and see if it fits with the world. Classes are only going to matter when it comes to weapons. You can choose pretty much any class you can think of, because I'm not using FF classes. Just tell me what your weapon is for your class. I'm not allowing, say, a wizard to equip a sword. Just like in standard roleplaying games, stats account for the ins and outs of a character. They are tested on a 20-sided die with 20 being the best roll and 1 being the worst. I'll be taking a page from D&D and use a +/- based system, which adds or subtracts numbers to a d20 roll. You get 15 points to allocate at the beginning. Each stat starts at 0 and each extra point increases the stat's modifier by +1 up to a max of +5. Alternatively, you can lower the stat to a negative modifier which gives you back a point to spend. The cap for negative modifiers is -5. It may sound complicated, but if you have questions, don't be afraid to ask. When you level up after a certain amount of battles, you gain 2 skill points to spend and the cap for both negative and positive modifiers raises by 1. Now for the stats. Also, everyone's HP is 20 combined with their Vitality modifier at the start. STRENGTH: This stat determines damage and hit rate with physical weapons. It can also be used for activities which require feats of strength, such as lifting heavy objects or climbing. DEXTERITY: This stat is unique and determines dodge rate/defense and rate of attack. 1/4 of the stat's modifier rounded up is coupled with the Strength Hit Roll and the modifier is added to your Armor Class your Armor Class (if you've played D&D, you know what this is. If not, it's the number an enemy has to get equal to or greater than on a hit roll to actually hit). This also determines actions which require precise maneuvering, such as crawling on wires or jumping across buildings. VITALITY: This stat's modifier determines health and adds its modifier to the Armor Class if hit by a physical attack. It can also be used for acts requiring a strong vitality, such as surviving a debilitating sickness or weathering an intense sandstorm. CHARISMA: This stat is unique because it doesn't affect in-battle circumstances. Instead it can be used for a variety of uses requiring charm, such as persuading a bandit to not fight you, raising morale, tricking a person, bribing a merchant or persuading a guard to let you pass. A famous mechanic of Final Fantasy 7 was the Limit Break system. With this system characters could pull off strong moves if they took enough damage. Basically, these are your characters signature abilities. The Limit Break system works like this: each character has a Limit Meter, which fills up after they take damage. The Limit Meter has a limit of 50 "Limit Points" for most characters. Every time you take damage you gain Limit Points equal to number of digits in the number times the first digit of the number. For example, if I took 2 damage, I would get 2 x 1 Limit Points, giving me 2 Limit Points. If I took 10 damage, I would get 1 x 2 Limit Points, giving me 2 Limit Points also. I know it's a weird system, but it works. Once you fill your Limit Meter to its max your standard attack becomes a Limit Break. Each character starts with one Limit Break and gains another once the highest Limit Break reaches 10 uses. You may unlock 7 Limit Breaks with this method. Your final Limit Break must be learned through doing a quest I will create. Each character will have a starting spot. 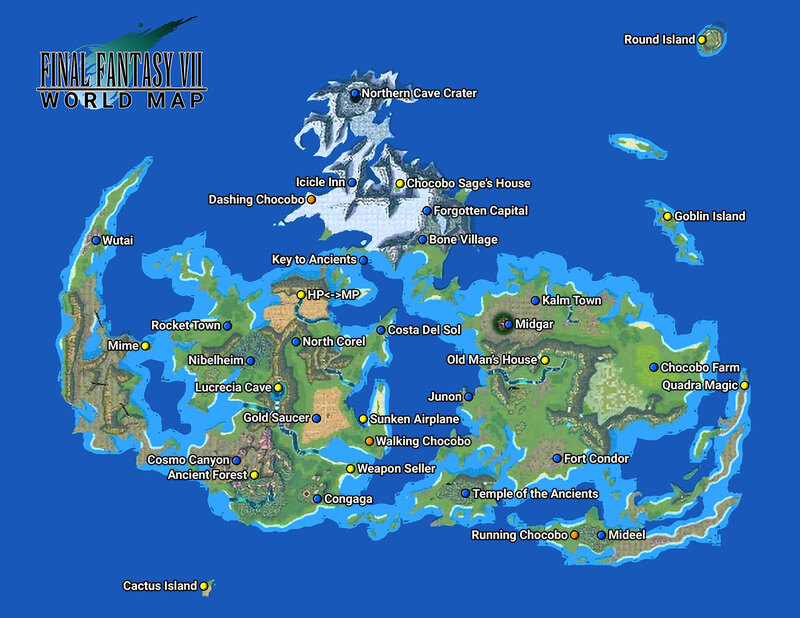 Here is the world map below, and with location descriptions. - Midgar: The largest, and most technologically advanced city on the planet. The city is run by Mako Energy, a highly productive energy source. The city and Mako production is run by Shinra Inc., a totalitarian, greedy corporation who barely resemble a corporation at all, more like a government. There are several parts of the city. -- The Slums: This is where regular people live. Due to negligence from Shinra, the area became a desolate wasteland of run down buildings and rubble. There are several Sectors, 8 of them in fact, and most are the same. However, Sector 8 has managed to stay away from decline, as its buildings are intact and commerce thriving. Even businesses not run by Shinra are allowed here. -- The Upper Plate: This is where Shinra's employees live. They are granted lavish homes by Shinra, much to the dismay of the ignored and punished people in the Slums. - Kalm Town: A town not too far from Midgar, it enjoys a peaceful, free way of life. Shinra supplies the city with Mako, which run many of its technologies. - Fort Condor: A fort on a mountain surrounded by a village of mysterious people. They are isolated from everyone else, but Shinra has tried time and time again to take the Fort as it is a nice strategic position. The village folk are friendly and will allow wayward travelers to live with them. - Junon: An old fishing town which fell into dilapidation. Shinra operates a major military base here, even with apartments for mostly the soldiers of the Shinra Army, but some are reserved for civilians. - Costa del Sol: A beautiful resort city distant from Shinra influence. Many people visit here from all walks of life to enjoy a refreshing vacation. - North Corel: An new settlement built by the survivors of Corel Town, which was blown up in a Mako Power Plant explosion. Corel used to be an important mining town before the explosion. The only important feature of the town is its train to Gold Saucer. - Gold Saucer: A grand amusement park tower which attracts many tourists hoping for a good time. The Saucer overlooks Old Corel, which is now a Shinra Prison. Gold Saucer contains Chocobo (fast ostrich-like birds) Racing, a Battle Arena, a Haunted House, a Theatre, an Arcade, a Gondola Tour of the Saucer, a Shooting Coaster attraction, and a Gift Shop. - Gongaga: A small village, which had most of its residents killed after a Mako Power explosion. It is now a shell of its former self. - Cosmo Canyon: A deeply religious village on the Cosmo Canyon for which it was named. Residents study the Study of Planet Life, a religion which observes all beings as interconnected through the Planet's energy. The Canyon remains neutral when dealing with Shinra. Historically the mythical Cosmo Canyonites protected the Canyon, but most were killed off by the Gi, a race of monsters. - Nibelheim: A small town next to the large and imposing Mt. Nibel. The town is relatively unimportant but used to be a popular spot for Shinra executives to vacation. - Rocket Town: A town built around a Shinra space rocket which was going to be sent in space along with its inventor, legendary inventor Cid Highwind. Unfortunately a malfunction caused the rocket to tip over, ruining all chances of Shinra space travel. The town carries on to this day relatively unharmed by progress. - Wutai: A very isolated country and city. It resembles Japan. Shinra reduced most of their territorial claims after a war. They were a prominent tourist destination, but now after the war are a small, forgotten country. They follow a unique religion and culture. - Bone Village: A village started by archaeologists in search of artifacts from the Ancients. In sits next to the City of the Ancients, a mysterious area which can only be accessed by obtaining a Lunar Harp to dispel the magic in the area leading up to the City. - City of the Ancients: A forgotten city, with mysterious buildings made to look like shells. This is an archaeologist's dream location. Not many enter here due to the rarity of the Lunar Harp, but those who have entered have reported a foreboding sense and chills.... (Note, if you want to start here, you have to include finding the Lunar Harp from Bone Village in your backstory). - Icicle Inn: A small town around a large inn. The area around it is a snowy desert. There's not much to do here, except snowboarding is a common hobby and the Inn is a great refuge from the biting frost. - Mideel: A hot springs town in the southeastern continent known for its closeness to the Planet's supposed energy. Grasslands Area: Grassland/Swamp. The west of Chocobo Farm is a swamp, where a giant serpent named Midgar Zolom prowls the marsh. Enter at your own risk. Corel Area: Grasslands/Mountains. The peninsula Costa del Sol is on is Grasslands, everything else is Mountains. Finally, roles. These are similar to classes but determine how you will roleplay. Essentially you can make any role as long as it makes sense, but here are some defaults if you don't want me to evaluate your role. Finally the good stuff. In this thread if you want to join fill out this template. Some notes first though. HP is 20 + Vitality modifier for character building. Each level you get 1d100 + Vitality score HP. MP (basically mana) is 20 + Spirit modifier for character building. Each level you get 1d10 + Spirit modifier MP. You can choose to have a shorter Limit Meter at a max of 40 points or 3 extra skill points. Limit breaks will be described as you unlock them. You start with one. Give an armor class for your armor item between 10-15 that makes sense for the item. Your first weapon has 2 Materia (aka magic) slots, and your armor item has 1. I will give Magic-y characters a Materia at the start of the game. Please give me your feedback! I hope this becomes a popular roleplay everyone will enjoy. Feel free to submit your questions, comments and concerns!